These leather dog collars are the perfect for any dog, they are buttery soft, super cute and very subtle. Bleu (our Frenchie) loves these leather collars, they are the only ones she will wear without constantly trying to scratch it off. 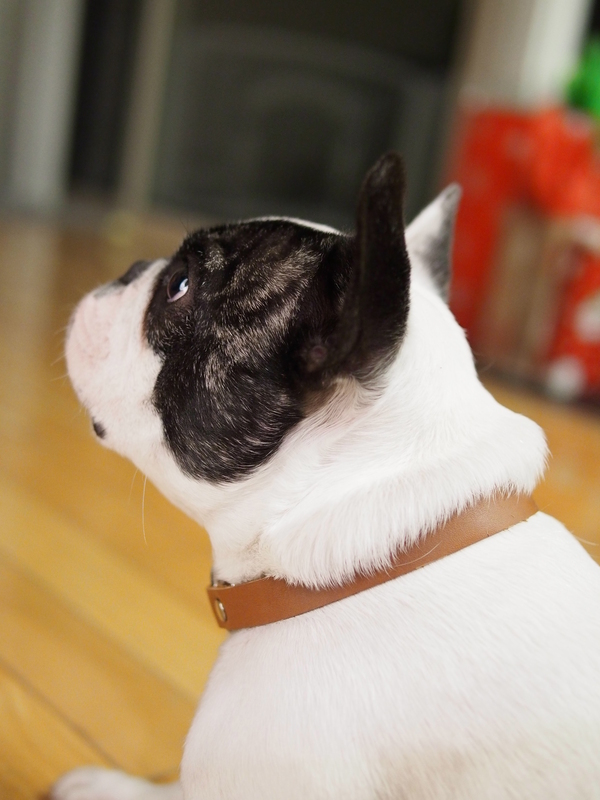 Below are simple steps on how to make your dog a new leather collar! Step 1: I cut my own leather strip, you can also purchase pre-cut strips at a local leather crafting store. The strip here is 1/2 inch wide and the length depends on your dogs neck size. Once your leather is cut, measure our where you will be punching your holes. Step 2: Using your rivets tool, add the rivets to one side of the ring. Step 3: To add a personalized touch, I embossed Bleu’s name on the collar. You can do this with a simple embossing tool. Congrats, you have created your pooch a new leather collar they will love!